I was really delighted when I boarded the Etihad Airways Airbus A330-300 from Zurich to Abu Dhabi and discovered the adjacent Flyer. 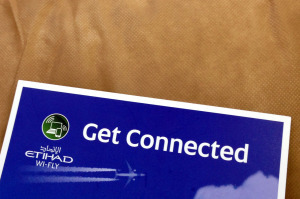 This “Get connected with Etihad Wi-Fly” had to be tried and as soon as the E-box, the on-demand in-flight entertainment system of Etihad Airways, could be used, I retrieved the information thus available. The E-Box has a socket (be careful, you need a travel adapter), as well as connection options for a LAN and USB cable. Thus, all power problems should be solved even for travellers without portable chargers. At the bottom of the E-Box there is a mobile icon. If this is red, flight mode must be enabled, if it is green, you may disable flight mode and the phone logs into the Aero Mobile network, through which you can make calls via your own SIM card with roaming. 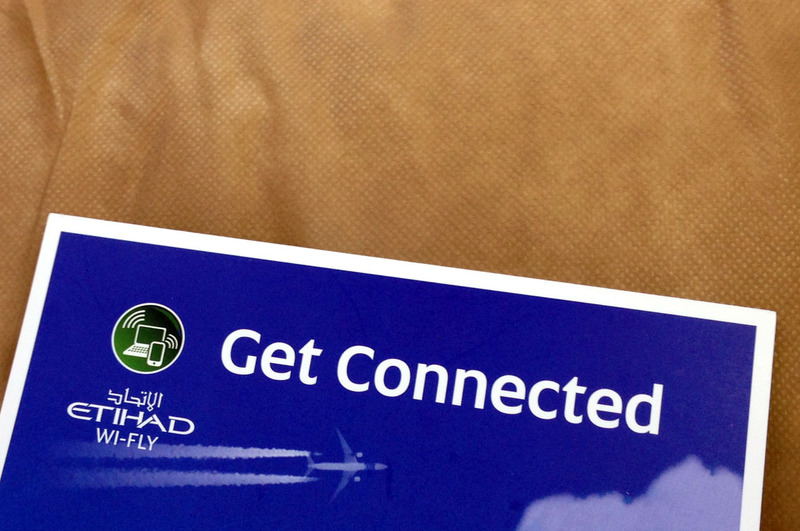 Now you can connect to the on-board WiFi hotspot “Etihad Wi-Fly” and it takes you automatically to the log-in portal. 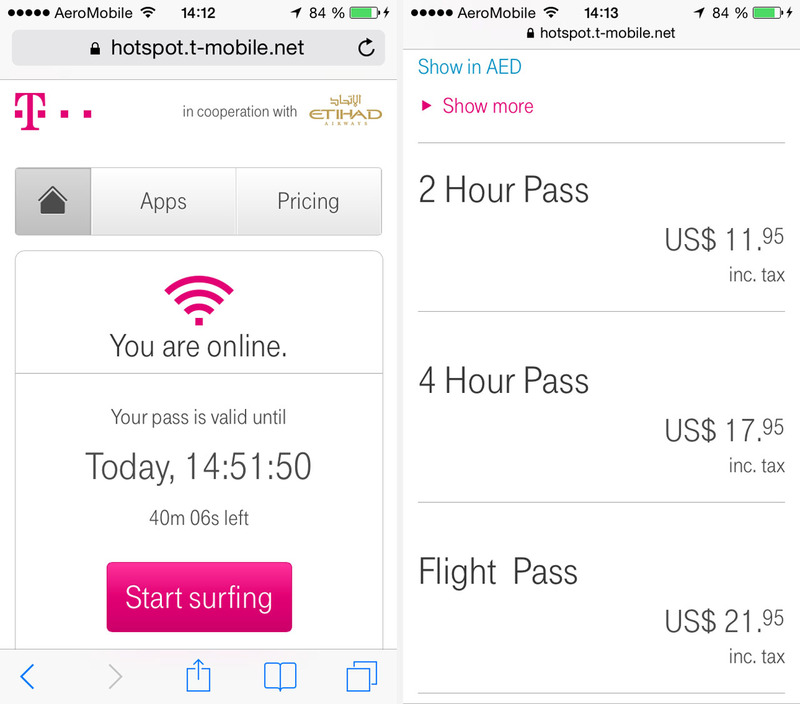 Etihad Wi-Fly is settled through your home mobile provider, so it took me automatically to the T-Mobile Hotspot. Here you will find the prices for access and you can book various packages. Unfortunately I could not use my existing hotspot account from my mobile phone contract and had to create a new one. No idea why that happened and nobody on board could explain it either. You can pay by credit card or PayPal. The complete booking process worked smoothly. Connection to the Internet was pretty fast and I didn’t lose the connection at all while I was using it. If I remember correctly, the Airbus A330-300 has a connection with 5 Mbit / s download and 1 Mbit / s upload and given the speed, I don’t think many passengers were online. As I said, the internet worked perfectly and at a price of about 10 € for 2 hours of access, there is nothing to complain about. I have paid much more money for significantly worse internet connection in numerous hotels. Although I am sometimes quite happy without internet, it’s nice to have the option and even better when it also works well. It is far too often otherwise, as I know from experience. Well done Etihad Airways, that’s the way to go!